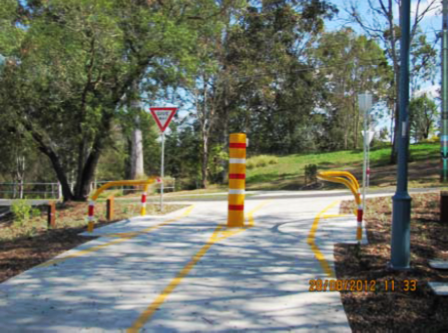 As part of the South East Queensland Cycle Network Program, Ipswich City Council received funding to extend the Brassall Bikeway from Workshop Street to Vogel Road. A total of 800m of 4m wide concrete bikeway, crossing 4 roads and 2 significant intersections. Works were undertaken in 2 stages commencing from the Vogel Rd end and finishing at Workshop St. The area in general is particularly flat and with some sections having grades approaching 1%, thus it was an ideal alignment for the former railway line from the Ipswich Railway Workshops to Grandchester. While these grades were ideal for pathway construction they also presented problems with storm water sheet flows as very little underground piped drainage was near the site to connect with and with all surrounding areas fully developed the slightest depression or bump in the natural ground presented potential ponding issues. During the course of construction following rain events it became evident existing drains in the easement needed reconstruction as a section of the easement for a length of nearly 250m contained significant ponding. RDS’s contract was extended by Council to provide a drainage solution and undertake these works. Being such a flat site, our only option was to grade a new drainage swale for 200m at 0.2% in the opposite direction to the natural fall of the land and fill a low area of ponding 50 m long as perfectly flat as we could achieve. The site was predominately reactive clays which present construction issues with ground movement and cracking of rigid paths. Construction of pathway expansion joints and subgrade preparation was therefore closely monitored in attempts to overcome any issues these clays may present in future.